We’d love your help. Let us know what’s wrong with this preview of Why Should White Guys Have All the Fun? by Reginald F. Lewis. To ask other readers questions about Why Should White Guys Have All the Fun?, please sign up. Be the first to ask a question about Why Should White Guys Have All the Fun? Before there was Oprah there was Reginald F. Lewis. So who is Reginald F. Lewis? Wall Street lawyer and financier who in 1987, achieved what many thought was an impossible feat. At that time, "the billion-dollar LBO (leveraged buyout) of Beatrice International Foods was the largest offshore leveraged buyout ever pulled off." Retold in a semi-autobiographical format, Why Should White Guys Have All the Fun? - How Reginald Lewis Created a Billion-Dollar Business Empire by Reginald F. Lewis and Blai Before there was Oprah there was Reginald F. Lewis. So who is Reginald F. Lewis? Wall Street lawyer and financier who in 1987, achieved what many thought was an impossible feat. At that time, "the billion-dollar LBO (leveraged buyout) of Beatrice International Foods was the largest offshore leveraged buyout ever pulled off." Retold in a semi-autobiographical format, Why Should White Guys Have All the Fun? 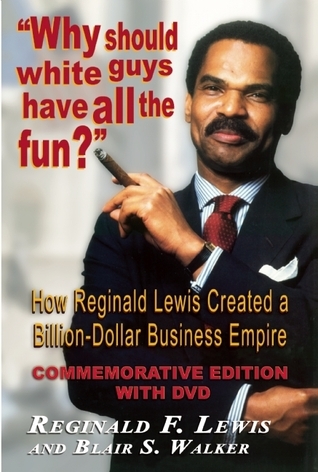 - How Reginald Lewis Created a Billion-Dollar Business Empire by Reginald F. Lewis and Blair S. Walker. Born and raised in East Baltimore, Maryland, the seeds of success were planted at an early age. Educated in the Baltimore public school system, he was a bright student, star quarterback in high school, and football scholarship recipient to Virginia State University in Richmond, Virginia. "He always had an agenda, a sense of purpose and direction," which served him well in both the legal and business worlds. In his junior year of college he was chosen to participate in a new summer program at Harvard University that was funded by the Rockefeller Foundation to "acquaint black college students with legal study." As a result of his experience he ended up being "the only person in the [148 year] history of Harvard Law School who was admitted before he applied." Reginald F. Lewis eventually started his own law practice Lewis & Clarkson and specialized in venture capital interests. This provided the foundation for TLC (The Lewis Company) acquisition of McCall Pattern Company; which resulted in a 90-1 gain and doubled McCall's income for the next two years and earned 12 and 14 million respectively. This set the stage for the billion-dollar Beatrice acquisition. This book lays out in detail the what, when, where, how, and why, it is essentially a manual for others to follow. •"In 1965, the highest ranking black faculty member at Harvard University was the assistant reference librarian." •"Colors and labels have a way categorizing people and creating artificial constraints around people and the way they think about themselves." •"Take a global perspective, don't neglect international studies, train your students to learn about international law, international business and tax." •The Chairman and CEO of TLC Beatrice Corporation. •The Lewis International Law Center on the grounds of Harvard University. •The Reginald F. Lewis Museum of African-American History and Culture in Baltimore, Maryland. •The Reginald F. Lewis High School of Business Law in Baltimore, Maryland. His accomplishments are an example of a Ralph Waldo Emerson quote, "Do not follow where the path may lead. Go instead where there is no path and leave a trail." Driven by desire and determination, he wanted to compete and win, irrespective of race. He loved the game, did the work, took the risks and eventually won! Reginald F. Lewis exceeded everyone's expectations except his own. I couldn't rate this book without considering the writing (not great), clinical approach, and apparent bias. HOWEVER, the subject of the book was no doubt an extraordinary force and businessman. He truly understood his own power and how to focus it. Reading this book definitely makes it a bit harder to come up with excuses. Face it, for years American business was dominated by one type of person. In the 80's, Reginald Lewis, with all of his unbridled ambition, had enough moxie to think he could play the game of business at the level of American titans too. He also had enough passion to win at it. I thought that this was a good book. As you read this book, you understand Mr. Lewis and how he had built a billion dollar empire. I don't want to give away the entire book. You must read it for yourself. I don’t think I aspire to be exactly like Reg Lewis, as he comes across as more mercurial and demanding of his subordinates than I’d like to be. I am though very happy he existed and enjoyed the fruits of his immense labors. His focus and fearlessness in life and commitment to social justice and racial equality were admirable as was his tenacity and willingness to be himself. He did his best to break racist stereotypes of what it takes and means to be successful and black not only in America but I don’t think I aspire to be exactly like Reg Lewis, as he comes across as more mercurial and demanding of his subordinates than I’d like to be. I am though very happy he existed and enjoyed the fruits of his immense labors. His focus and fearlessness in life and commitment to social justice and racial equality were admirable as was his tenacity and willingness to be himself. He did his best to break racist stereotypes of what it takes and means to be successful and black not only in America but also in Western Europe, and for that I’m grateful to have heard his story and proud he lived it. He makes me want to be as successful in my own way, which I think he would’ve applauded. This book was recommended to me by my brother who is in law school. Prior to reading it, I never heard of Reginald Lewis, who was a success American business mogul (millionaire/billionaire) of the 80s. I really enjoyed reading the first half of the book about Reginald Lewis' upbringing in Baltimore, MD (close to where I live). Lewis was a peculiar child/teen and super serious adult so I found some of his habits, antics, and social bondings as described in the book comical. As the book delve into This book was recommended to me by my brother who is in law school. Prior to reading it, I never heard of Reginald Lewis, who was a success American business mogul (millionaire/billionaire) of the 80s. I really enjoyed reading the first half of the book about Reginald Lewis' upbringing in Baltimore, MD (close to where I live). Lewis was a peculiar child/teen and super serious adult so I found some of his habits, antics, and social bondings as described in the book comical. As the book delve into the stories of Lewis' business and acquisition strategies (most in first person narrative), which I thought ingenious, it was a slightly more difficult reading. I would definitely recommend this book to anyone who likes/loves unique biographies, business deals, business law and/or just interested in stories about people who pursued a dream, overcame limitations, and achieved success. This feels like a fluff piece. I don't believe Reginald F. Lewis is the author of this book. It might even state that somewhere in the literature and I just missed it. To me his contribution is the plethora of excerpts. Whomever never ventures into Lewis's gray areas while hinting they are there. They just prance over them. Putting that aside, this book has several section worth dissecting and interpreting. Just to put some out there are his complex business dealings and the large number of succ This feels like a fluff piece. I don't believe Reginald F. Lewis is the author of this book. It might even state that somewhere in the literature and I just missed it. To me his contribution is the plethora of excerpts. Whomever never ventures into Lewis's gray areas while hinting they are there. They just prance over them. Putting that aside, this book has several section worth dissecting and interpreting. Just to put some out there are his complex business dealings and the large number of successful people heralding from Baltimore Maryland. For those looking for a role model, look no further. For those in search of a great biography, this leaves you wanting more and it shouldn't. Great book, a PHENOMENAL man! Inspirational much as a black KAPPA man seeking success, wealth, and much more; tangible and intangible. This book describes a real achiever and a prime example of always moving forward despite the adversity that you may encounter. A forever role-model in my eyes, this book left a impression on me as if I knew Lewis personally. A recommendation for anyone dedicated to learning about a great MAN creating his own financial independence. Fantastic window into Reginald Lewis' life and approach to business. Took away a bunch of lessons. Meh! I had high hopes for this book, but I found it to be poorly- written. I couldn’t get through the first few pages. Not only have I read this book twice, (one of three books I have reread from cover to cover), but I have also gifted this book to several people. I also encourage it as a must read. If you have ever been told that you can't do something, this will provide the encouragement of one of my favorite sayings: No doesn't mean no, it just means not right now. There are two books that I always encourage people to read. This is one of them. The other is The 48 Laws of Power by Robert Greene. Reginald F. Le Not only have I read this book twice, (one of three books I have reread from cover to cover), but I have also gifted this book to several people. I also encourage it as a must read. If you have ever been told that you can't do something, this will provide the encouragement of one of my favorite sayings: No doesn't mean no, it just means not right now. There are two books that I always encourage people to read. This is one of them. The other is The 48 Laws of Power by Robert Greene. I know the book sounds a little racy, but this book personifies the attitude that an African American Man has to have when it comes to building a Billion Dollar Business. I learned that Reginald Lewis had to step back twice and reorganize his plan before he moved forward with the purchase of McCall Patterns, the JV Agreement with Brook Shields, and his relationship with the Junk Bond King. This was done in the 70's and 80's without a Black President... what can we do now? Mr. Lewis was the first Black billionaire I believe and quite a business leader. He made substantial gift to Harvard University. His life was cut unfortunately short by brain cancer. When he died, there was some theorizing that his heavy use of cellphones was to blame. His wife has carried on his legacy and created scholarships in his honor and a few other iniatives. As an HBCU graduate (NSU) and fellow Nupe, I enjoyed this read. Bro Lewis' dedication, boldness, and courage to exceed the normality in all aspects of his career is definitely something to look up to. Loved this book. Changed my way of thinking about business in a lot of ways. Inspirational and moving, a true pioneer of his time for African American students of business. Definitely a book that I will revisit from time to time. Reginald F. Lewis - Catalyst of motivation to achieve. The book is a "game changer" in my life!